There are many different ways to shape your rolls. In this post, you will find 5 common shapes: Parker House, Crescent, Rosette, Cloverleaf and Butterflake. This is a style that my mom made for many years. 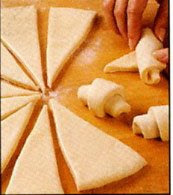 Roll each portion of dough to 1/4" thickness. Cut dough with a 2 1/2" round cutter. (I used a clean tuna fish can). Brush with melted butter or margarine. Using the dull edge of a table knife, make an off-center crease in each round. Fold each round along crease with large half on top. Press folded edge firmly. Place rolls 2-3" apart on greased baking sheets. This is my favorite method. Fast and easy! 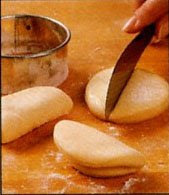 On a lightly oiled surface, roll each portion of dough into a 12" wide circle. This recipe makes 2 piles of 12, equaling 24 rolls. Brush with melted butter or margarine. Cut each circle into 12 wedges with a pizza cutter. To shape, begin at the wide end of the wedge and loosely roll toward the point. Place point side down (this is important!) 2-3 " apart on greased baking sheets. This is my favorite style for hamburger buns. Divide each dough portion into 16 pieces. On a lightly oiled surface, roll each piece into a 12" long rope. Tie into a loose knot, leaving 2 long ends. Tuck top end under roll, bring bottom end up and tuck into center of roll. Pinch loose ends together. Place 2-3" apart on greased baking sheet. Flatten slightly with palm of hand if making hamburger buns. This is a style that I sometimes see in restaurants. Divide each portion of dough into 36 pieces. Shape each piece into a ball, pulling edges under to make a smooth top. Place 3 balls in each greased muffin cup, smooth sides up. 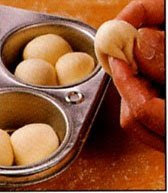 Roll dough to 1/8 inch thickness; brush very lightly with melted margarine. Cut into strips 1 1/2 inches wide; pile 4 to 7 strips together and cut into pieces 1 inch wide. Place small side up in greased muffin pans. When rolls have been shaped, cover and let rise until double in bulk. FRIEDA!!! You're AWESOME!!! It's so COOL to be back in touch with you, after 25 years! THANKYOU SO MUCH for teaching me how to shape rolls! I had such a BLAST with you in your kitchen last week! My favorite shapes are the crescent and rosette! My 5 yr. old daughter, Olivia, LOVED the dog bone shape (she really thinks she's a puppy)... I'm going to TRY to make the roll recipe this week! I'll let you know how it goes. Wish me luck! HUGS!! !